Fame-and-fortune seekers have flooded Donkey Kong Country in search of the fabled, Lost World. You command Dixie Kong and Kiddy Kong through thirty-six Kong-sized levels of action and adventure. Use your animal friends -- Squitter the spider, Squawks the parrot, Ellie the elephant and Enguarde the swordfish -- to help you prove your adventuring skills and find the Lost World before someone else does! 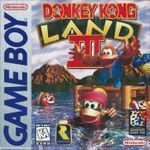 - Play as Dixie Kong or Kiddy Kong! - Four different animal friends! - Secret areas and bonus levels galore! - Battery-back memory saves three game files!